The RBC in the center of the field contains several Howell-Jolly bodies, or inclusions of nuclear chromatin remnants. There is also a nucleated RBC just beneath this RBC. Abnormal and aged RBC's are typically removed by the spleen. 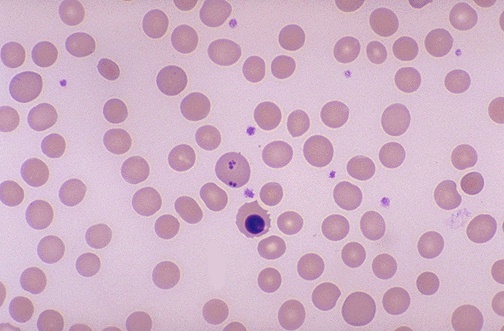 The appearance of increased poikilocytosis, anisocytosis, and RBC inclusions suggests that a spleen is not present.